Epiphytic plant with short stem , completely enclosed by imbricating leaf-sheaths. Leaves slightly arcuate, oblong-elliptic to elliptic-obovate, acute or obtuse, tapering toward base, canaliculate above, of more than 23 cm. long for 7 cm. wide. Flower stalk more or less recurvate, soft, may be a little longer or shorter than the foliage, carrying many flowers. Rachis vaguely quadrangular. Bracts persistent, small, ovate or triangular, from 2 to 4 mm. 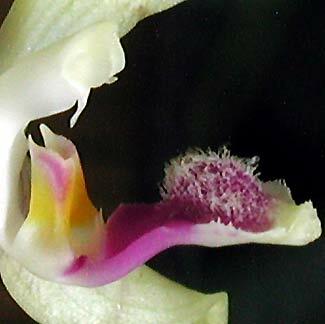 Flower fleshy from 4 to 5 cm. Sepal dorsal elliptic or oblong-elliptic, obtuse or almost acute, slightly ducted dorsally near apex. Lateral sepals obliquely ovate-elliptic or oblong-elliptic, acute or sub-obtuse, canaliculate above, distinctly ducted dorsally along the median vein. Petals from cuneate base oblong-elliptic, obtuse or sub-acute. Lip shorter than the petals, 3-lobed. Lateral lobes erect, obliquely quadrangular-oblong, with cushion-like swelling in middle, semi-falcate apex. 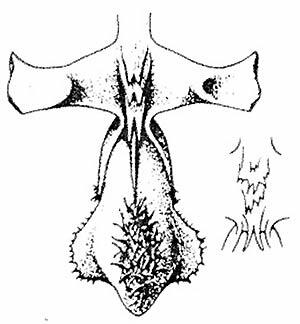 Convex midlobe, very fleshy, ovate-rhomboid outside, with a toothed or fimbriate margin erect. Its apex is provided of an ovoid callus densely covered of rigid hairs. A median keel , membranous, relatively low, notched, cut the median lobe into two. Disc between lateral lobes with two superimposed callus , normally bifides, sometimes as lacerated or notched. 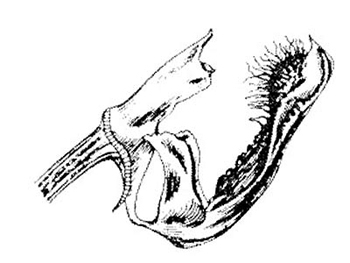 At junction of midlobe and lateral lobes one clearly distinguishes a projection bifide, acicular, fleshy. Column erect, fleshy, cylindrical, from 6 to 8 mm. Pedicellate ovary of 2/3 cm. Color varies from pure white, cream, to white/greenish. Some forms have only the tips of sepals and petals green or presenting a greenish suffusion. The floral segments, and more particularly the lateral sepals are decorated in their lower half of magenta transverse bars . Certain flowers are absolutely without mark, others have the lateral sepals almost completely marked. The midlobe and the apex of the lateral lobes are usually magenta. The callus of the lateral lobes are yellow. Free flowering, with a predilection for the end of the summer and the autumn. 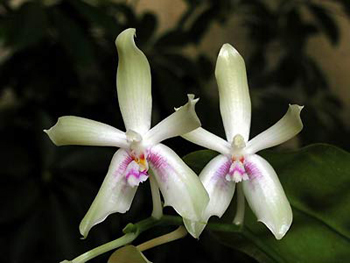 This phalaenopsis grow since the sea level until an altitude of 450 meters. In culture, he need a perfectly well drained medium. It's possible that a rest period initiate flowering? Discovered in 1921 in Java. 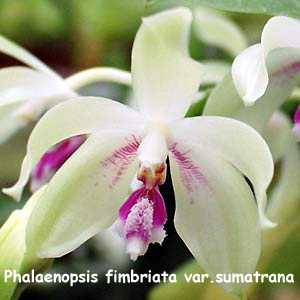 This species is easily differentiated from other Phalaenopsis with small white flower like Phalaenopsis tetraspis, Phalaenopsis hieroglyphica and Phalaenopsis micholitzii, by the edges raised and densely fimbriate of the midlobe, and by the very hairy callus occupying the apex of this one. Flower 1/3 larger than the type. Very tilted midlobe, peak more distinct, endemic of Sumatra. 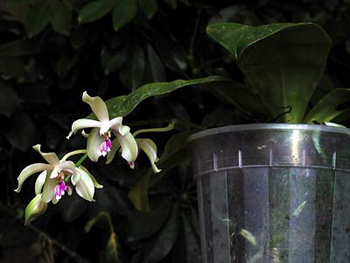 He could be found between 700 and 1300 meters of altitude, sometimes with Phalaenopsis viridis, and sometimes in litophyte on escarped and mossy ripraps exposed to east or south.